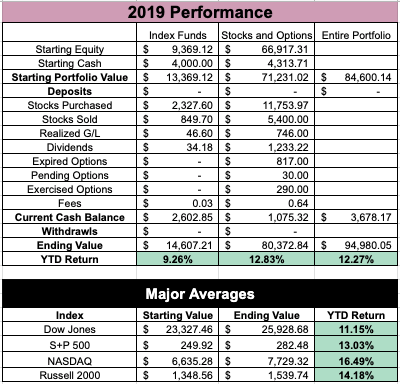 My portfolio returned 12.27% in Q1 2019, which came in below the S&P 500’s 13.03%. The index fund portion of my portfolio has been re-tooled as it prepares for $100,000 in additional funding over the next few years. 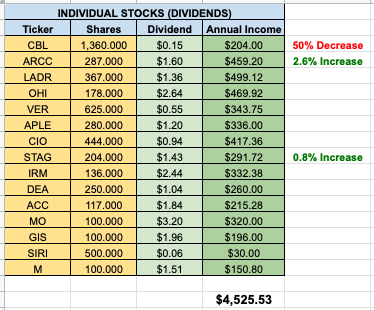 The individual stock portion of my portfolio delivered $1233 in dividends, which was up 30% Y/Y. Selling Puts/Calls resulted in an additional $817 in cash premiums in Q1. However, these gains were offset by some ill-timed entries into two stocks which will be discussed here. Q1 2019 was almost an exact mirror or Q4 2018, just in an upwards direction. The individual stocks in my portfolio experienced a return of 12.83% during Q1 while the index fund portion of my portfolio experienced a return of 9.26%. During the quarter, I rearranged the index fund portfolio to be 100% equities after being challenged in my last article about the logic of including a market correlated bond fund in the Vanguard Long-Term Corporate Bond Index ETF (VCLT). I also had covered calls in Roku Inc. (ROKU) and Symantec Corporation (SYMC) called away, while having put options in Macy’s, Inc. (M), FireEye, Inc. (FEYE), Cloudera, Inc. (CLDR), and NIO Inc. (NIO) assigned. In this article, I’ll give a breakdown on each of these sections and give an update on where the portfolio stands heading into Q2 2019. 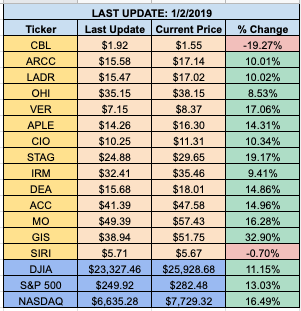 Before I begin, I’ll give a taste of what’s to come by providing a full breakdown of all of my buy and sell activity during Q1 2019. Originally, I had included VCLT as a 4.5%-yielding monthly bond piece of my portfolio. However, because VCLT tracks the performance of the Bloomberg Barclays U.S. 10+ Year Corporate Bond Index, it tends to perform well when the equity market performs well and perform poorly when the equity markets perform poorly. In theory, If I were going to have bond exposure, it should be one that has a negative correlation with the stock market. This section of my portfolio holds positions that I do not plan on ever selling. My hope is to one day pass along the portfolio to my kids. Given that logic, I’ve adjusted this portfolio, despite not having the intention to do so when I established it in Q4 2018. I’d rather admit the mistake and re-tool than commit to buying something for life just because I don’t want to look like I didn’t have it all figured out three months ago. My purchase of IJH didn’t happen until the tail-end of March. I learned a lot about myself during October-December 2018 (e.g., that I couldn’t buy enough of everything), and I learned a lot about myself during January-March 2019 (e.g., that I buckled waiting for pullbacks rather than just commit the capital on a relatively fixed schedule). I still find “how much cash do I hold for pullbacks” to be an interesting question I haven’t figured out yet. There may come a day where I scale back the overly aggressive exposure to growth (e.g., QQQ) by adding value names such as the Vanguard Value ETF (VTV). However, when that day comes, I will adjust by buying the VTV not selling off the QQQ. Gameplan for Q2: I anticipate adding $12,500-15,000 into these funds over the next few months. The short-term plan is still to commit new capital to this section of the portfolio, with the individual stock section only gaining new capital from dividends/options. 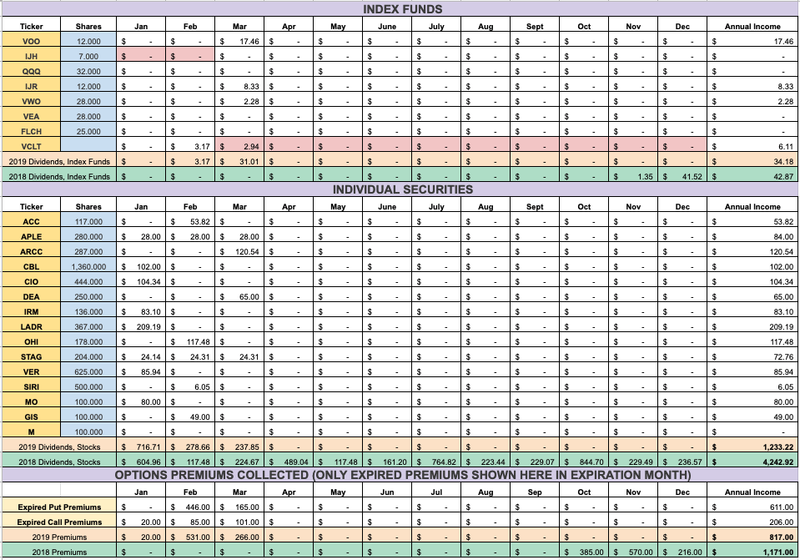 Over the next few years, my goal is to have the index fund section of the portfolio make up 80% of the overall portfolio - right now it only makes up 13.15%. During Q1 2019, I exited positions in Roku Inc. and Symantec Corporation, while entering positions in Macy’s, Inc., FireEye, Inc., Cloudera, Inc., and NIO Inc. I’ll briefly talk about Roku Inc. and Symantec Corporation first before giving a quick update on the ones I entered into. Symantec Corporation ended up being something that I traded options around the $20 price for 90 days for a small gain. Alongside the broader market, SYMC dropped to $17.96 on Christmas Eve. I sold a covered call on SYMC on 1/4/2019 when it was trading at $19.36, thinking at the time that the market wasn’t going to have the straight-line V recovery. Depending on how you look at returns, you could argue I did a little better than what I’ve presented. Once I exited the position, I traded SYMC into earnings and picked up another $104 in premiums. I was only in this trade for 3 days. If you add that into my returns from holding the stock, my total SYMC realized gains were $193 in about 94 days (40% annualized return on $2000 initial collateral). At the time of this writing, SYMC trades for $22.99. Roku Inc. certainly surprised me, to put it mildly. I sold a $41 covered call on ROKU during the first trading day of the new year when it was trading for $32.52. The idea was to pick up a small premium and then trade it more aggressively into earnings. Three days later, the stock was trading above $44 on company news that accounts were up 40%. That, along with general market recovery, sent the stock absolutely soaring. ROKU only traded for $43.69 on my $41 covered call expiration date. However, I decided to collect my short-term $700 profit rather than spend $270 to close the call and sell a $49 call post-earnings to breakeven on the $270 premium I would have collected. I figured with how much it had skyrocketed in a short time, earnings may have been too risky and the stock may have tumbled back down. Hindsight being 20/20, I missed. At the time of this writing, ROKU trades for $64.51. Macy’s was a name I traded in the latter stages of 2018, collecting some put premiums. I entered Macy’s at $26.50 for 100 shares. Currently, trading at 6x last year’s earnings seems like a steal. Q4 2018 earnings were very impressive, and the company continues to pay down its debt, down almost $2 billion in the last 2 years. It currently sports a healthy dividend yield of 6.29%. While not growing like it was during 2011-2015, I think the company is positioned well, unlike peers in the space. Macy’s will suffer from the death-of-the-mall narrative, but I continue to like it for $34-35 a share. NIO ended up being an ill-timed options trade. I traded $7 options into earnings when the stock was trading on its 60-minutes high at $10.50. Even with an earnings season that had to bring the stock down a little bit, I thought the stock had a nice support base at $8. After earnings were released, NIO dropped right to $8. However, it blew way past most expectations, even dipping into the $4s for a little bit there. While the demand slowdown narrative was important, so too was the better-than-expected Q4 that has failed to garner attention. I still think this company is the best way to have EV exposure and China exposure (which I talked about wanting to have in Q4 2018). This portion of the portfolio delivered $1233 in dividends, which was up 30% Y/Y. This increase was primarily due to the addition of additional stocks, although Ares Capital (ARCC) and STAG Industrial (STAG) announced modest upticks in Q1. CBL & Associates Properties (CBL) did announce that it was suspending Q3 and Q4 dividends for 2019, which will erase $204 in expected dividends this year for me. This portion of the portfolio was up 12.83% in Q1 2019. Big quarters by General Mills (GIS) - up 32.9% YTD - and a handful of my REITs (STAG up 19.17%, VEREIT Inc. (VER) up 17.06%, Easterly Government Properties Inc. (DEA) up 14.86%, and Apple Hospitality REIT (APLE) up 14.31%) were offset by losses in NIO (down 27.14% from my $7 entry) and CBL (down 19.27% after being up as much as 35% earlier in Q1). I continue to play with selling puts into positions and covered calls once in them to generate some additional premium. I sold $160 worth of covered calls in Sirius XM Holdings (SIRI) around the $6 strike all quarter. My total cost basis in SIRI is now effectively $5.61, thanks to put/call options, netting me a razor-thin total return of 0.24%, which is certainly better than being down 6.5%. Gameplan for Q2: With a low current cash balance ($1,075), I expect Q2 to be continuing to play with covered calls. GIS has not slowed down alongside the broader recovery and also from its latest earnings report. However, I may begin to sell month-long covered calls in the name around $55. I plan to sell NIO covered calls into its next earnings release to get some premium. Holding 700 shares does give me some more flexibility to play with how I want to structure the covered calls. I’ll continue to sell SIRI $6 calls, as the stock seems to play right around that range. No changes are anticipated for the REITs, as I continue to take their dividends in cash and play around elsewhere. Here are all of my portfolio updates to date in the event anyone is interested in how the portfolio has been shaped over time. I will (in time) eventually leave the last 8 quarters here. As always, please let me know in the comments section what could have been better as I continue to improve these update articles for you guys! Disclosure: I am/we are long VOO, IJH, IJR, QQQ, VEA, VWO, FLCH, ACC, APLE, ARCC, CBL, CIO, DEA, IRM, LADR, OHI, STAG, VER, SIRI, MO, GIS, M, CLDR, NIO, FEYE. I wrote this article myself, and it expresses my own opinions. I am not receiving compensation for it (other than from Seeking Alpha). I have no business relationship with any company whose stock is mentioned in this article.